The history of the Holy Crown goes back a long way and tells a story full of dramatic event. During the reign of Queen Maria Theresia, the Holy Crown was preserved in Vienna. 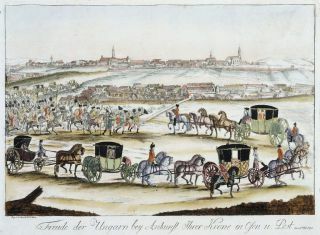 In 1780, when the Holy Roman Emperor Joseph II (1765–1790), son of Maria Theresia, ascended to the Hungarian throne, the Holy Crown was kept in Vienna but Joseph II refused to be crowned with it or take the coronation oath. For this reason he was named Pál Ányos, and this is why his nickname “king of Hut” was widespread all over in Hungary. Following his death, the Holy Crown was returned to Buda in a ceremonial procession to the Royal Castle. On the occasion the diet was summoned there, which had last happened in 1530. The engraving represents the ceremonial procession, and is well known as the first and only example of such a festive event in Hungary. 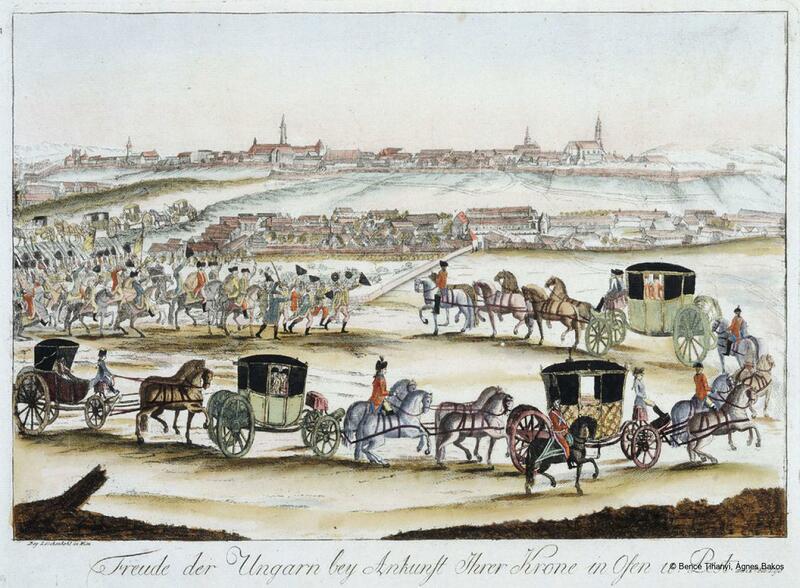 An engraved representation of the return of the Holy Crown of Hungary from Vienna to Buda in 1790. Purchased from an art dealer between the two world wars in Budapest. Budapest az Újkorban (Budapest in the Modern Times), (ed. G. Szvoboda Dománszky), Budapest, 1995, p.23.